My husband Ted and I spent a week with Charlie and Rachel DeTellis, mission directors in Haiti, along with a mission team from First Baptist Woodstock, Georgia. One of the team members spoke at a mid-week service at the Bire church and gave an invitation. Two young women responded to the call of salvation after hearing an amazing testimony and the Good News. Later that week, while walking on the mission grounds toward the ocean, we saw believers from our Bire church—including one of the young women who had just prayed to accept Jesus as her Savior—preparing for baptism. How our hearts rejoiced watching her be baptized. Four others were baptized with her. 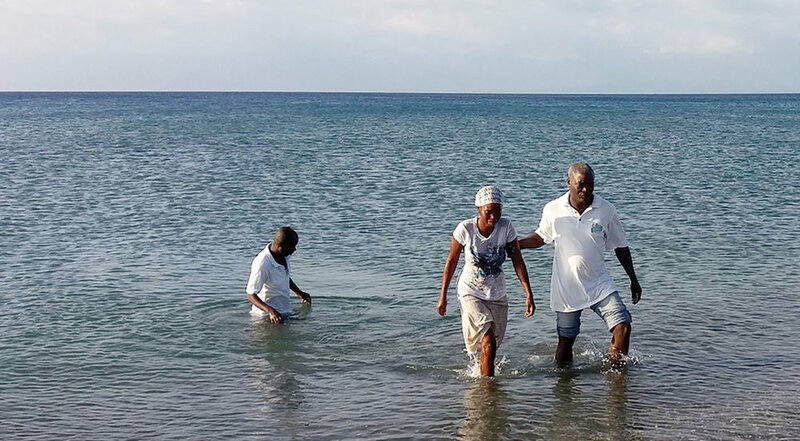 Pastor Jean Panel Louis from our church in Bire, Haiti, hosted a baptism service in Bord-Mer. The celebration of believer's baptism in Haiti is a day of coming together to rejoice. A decision to be baptized in Haiti is a serious, carefully thought out determination to follow Jesus. I am grateful for the first memories of baptismal services on the oceanfront, when the mission was first started in the 1980’s. Lives are being changed forever because of the power of the Gospel.